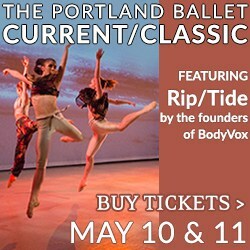 The Portland Ballet presents CURRENT/CLASSIC May 10 & 11 • Lincoln Hall 7:30pm ~ SPECIAL DEAL FOR ONE WEEK ONLY! All tickets 10% off, April 1 - 7, 2019 -- SNEAK PEAK! 2019 Summer Ballet Intensive ~ July 8th - August 3rd ~ A four-week long intensive summer program offering a varied dance experience, professional faculty, and a supportive structure. Did you miss auditions?